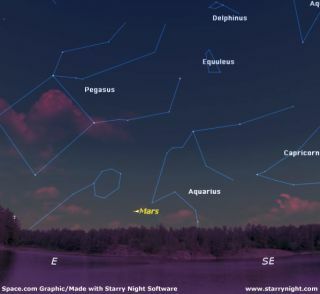 SKY MAP: The sky as seen at 5:30 a.m. on May 4 from mid-northern latitudes. For the past several months, Mars has been dawdling very lowin the east-southeast sky and mired deep in the dawn twilight, making itdifficult to see. Finally, the red planetis beginning to brighten up. In the coming weeks Mars will be gaining altitude whileprogressing into a darker part of the sky. Currently, it's rising south of eastabout two hours before sunup. It hangs nearly motionless above theeast-southeastern horizon as seen at dawn all month, while the faint stars ofAquarius slide behind Mars and toward its upper right. Through a telescope,first magnitude Mars is disappointingly tiny. The best views we can get of Mars come when the Earthovertakes the slower-moving Mars in their respective orbits. That also usuallyoccurs within a few days of the two planets making their closest approach toeach other and in our sky Mars appears directly opposite to the Sun in thesky--rising at sunset, appearing highest in the sky around midnight, and settingat sunrise. Astronomers refer to this as "opposition," but thenext opposition for Mars is still a very long way off (Christmas Eve to beexact) so it's going a while before it will appear large enough for atelescopic view to be worthwhile. Mars will actually reach its closest point tothe Earth--54,783,381 miles (88,146,460 kilometers)--about a week earlier, onDec. 18. Right now, Mars is still rather far: about 163 million miles(262 million kilometers) away. But by late December, it will be glowing morethan four times brighter, at magnitude -1.6. That's a bit brighter than Sirius,the brighteststar in the sky. Now for something a bit different: just about this time ofyear over the past three years, people start receiving an e-mail titled "MarsSpectacular," which has circulated widely on the Internet from ananonymous source. In turn, this message has ended up being passed along toothers who simply couldn't resist forwarding it to their entire address book; asnowball rolling down a hill is a good analogy. This e-mail declares that on Aug. 27, Mars will be closer toEarth than it has in the past 60,000 years, thereby offering spectacular viewsof the Red Planet. The commentary even proclaims, with liberal use ofexclamation marks, that Mars will appear as bright as (or as large as) the fullMoon. The problem is that "Aug. 27" actually refers toAug. 27, 2003. Mars did indeed make a historicallyclose pass by Earth that night. But, to the naked eye Mars merely appearedlike a brilliant yellowish-orange star, certainly not anything like the fullMoon. So this Mars e-mail is completely bogus. Yet it now seemsthat every year in the late spring or summer, it gets revived. Now I would like to make a request: If in the coming daysand weeks you find yourself a recipient of this Mars e-mail message, I wouldsuggest that rather than forward it on to others, you simply hit the "Delete"button on your computer keyboard; better yet, why not forward the article you'rereading now to the person who may have passed the e-mail on to you. In thisway, you'll be providing an antidote to this Mars computer virus.